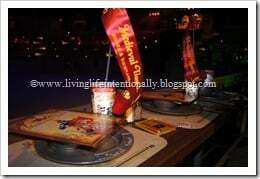 For Goofy’s birthday this year we took him to Medieval Times. It’s not cheap, so we waited until we thought he was old enough to remember and appreciate it. There are 9 locations to pick from.It was a really cool thing to do once, but I wouldn’t feel the need to rush here all the time. 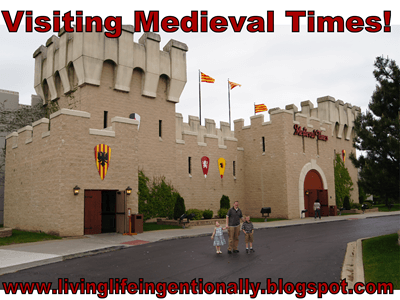 HINT: This would be a great fieldtrip after a middle ages for kids unit! Commemorative program – this was a nice souvenir as it had really good pictures of the knights and some of the events. 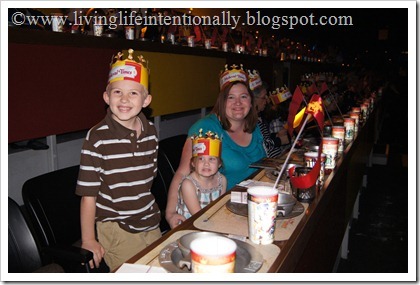 Crown – everyone gets this! They tell you to arrive like an 1 1/2 hour early. I don’t recommend it! If you have VIP seating I’d say 30-45 minutes, enough time to take your picture and use the bathroom. 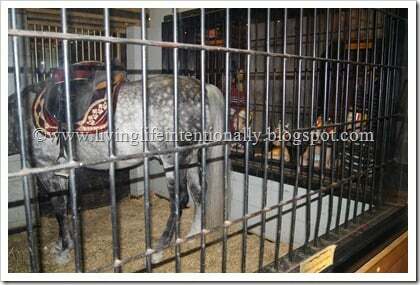 There is a dungeon ($3/person) that is a racket with like 12 itty bitty exhibits of torture! There is no dungeon if your kiddo was hoping for one like mine was. You can take a look at the horses for free, but that won’t take you long. Other than that there is lots of stuff you can buy…..and you wait. 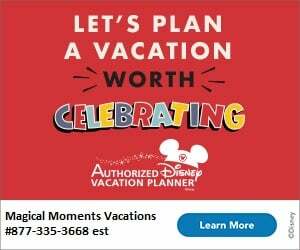 I think if you opt to not do the Celebration Package having the knighting ceremony would be really special. 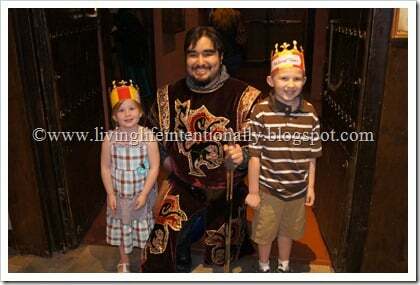 You can pay to have the king make you a knight and it might be more fun for the kids than the announcement or cake. There is a little procession, you wear a cape and the king uses his sword and knights you. You also get a certificate/picture. When it is time to enter you will enter by color (they decide for you) of knight you are cheering for. At your spot will be your package freebies. You sit in theater type chairs with a counter in front of each row. The server will bring 2 rounds of soda (there are 4 choices: coke, diet coke, sprite, or water), tomato soup (from thermos), focaccia (very good), chicken, rib, potato wedge, and pastry for desserts (ours was an amazing apple pastry!). The food, other than the focaccia and pastry was fine, but nothing exciting. They will call your soup dragon breath and chicken baby dragon, etc. It is also worth noting that you are in medieval time so you will not get any silverware to eat with. 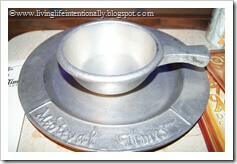 You will get sturdy pewter plates. There are plenty of napkins – it all adds to the experience. 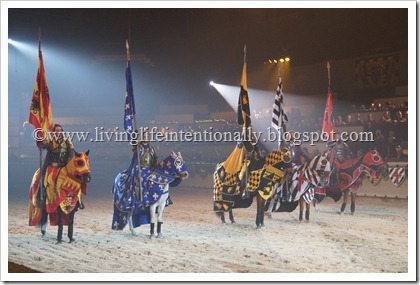 While you eat the knights will perform different events – jousting type tournament events. You cheer for your colored knight. At the end of each round the princess will throw the knight a flower that he will then throw to someone in his cheering section (so cheer loudly!) 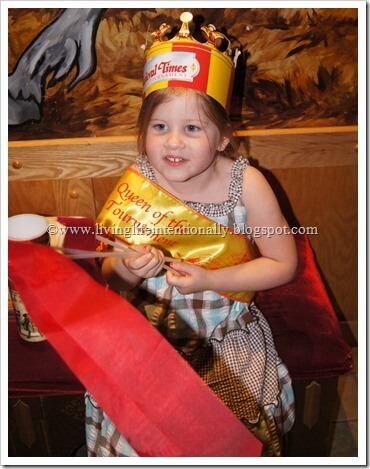 At the end of the tournament each knight will get a sash that says “Queen of the Tournament” that they will give to someone – Minnie got it & was SO EXCITED!! Then it moves on to the story part (which was honestly hard to understand with the sound system). The netting will go down as they “fight” and if you have a little boy he will be amazed at the fighting scenes. The show lasts about 1 1/2 hours. By the end you will have your picture and be set to go so they can get the next group in. The server will let you know his gratuity isn’t included. By the way it is REALLY hard to get pictures with all the special effect smoke & lighting. So get the free picture, snap a picture of your family & your night & then put your camera away & enjoy the show! Overall it was a really neat experience! LOTS of fun & very memorable!! 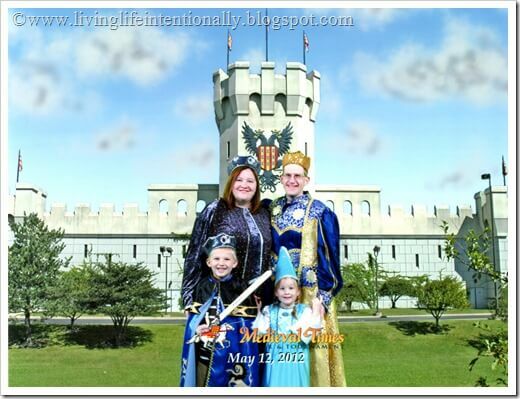 Our kiddos still talk about it and look forward to going back!! (In case you were wondering, Tinker Bell stayed home with Grandma & Grandma. 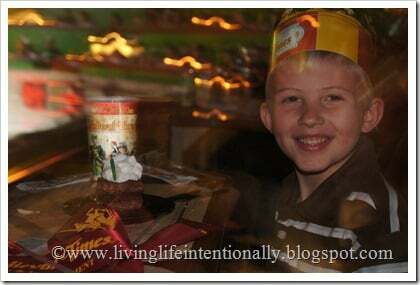 We thought that although she would like it, she would be wiggly and harder to entertain – taking away from the attention we could give the birthday boy) This is definitely worth doing once (with a coupon). Although I wouldn’t feel the need to rush out & do it again later this year….. maybe in a couple years.